These are the type of prints I love to wear in the summer. 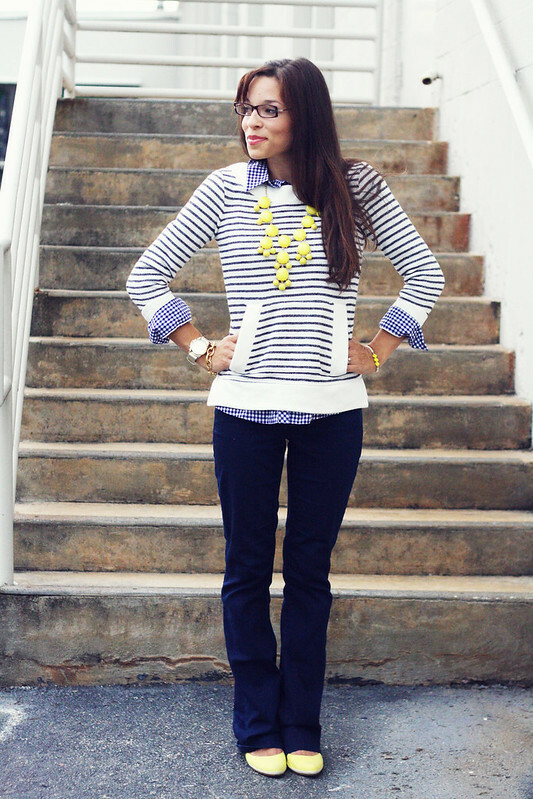 A little gingham here...a little stripes there...and always a good dose of yellow. I will be re-mixing these numbers often! What are your summer frequents? P.S. Now you know something new about me. I have to wear glasses when I drive, watch movies, or work behind the computer! i looove this outfit! i'm always timid about pattern mixing but i could do something like this i think. you look wonderful! Anna! Loving the combination of prints you have going on here and the burst of color! You look so cute! So adorable! I almost bought that striped sweater, love it! And I too wear glasses when I'm driving/reading/working at the computer :) If you have to wear glasses, might as well wear cute ones! Have a great Monday, Anna! That striped shirt looks SO comfortable. I need something like that. It's decided.....you're going to come live in my closet and dress me everyday! :D LOVE everything about this outfit, Anna! Ah! I saw the shot without your head of this outfit on pinterest and instantly fell in love-- so pleasantly surprised to find out it's you!! just love this dressed up hoodie with the pattern mixing going on and yellow accents. gorgeous. You should write a post about patten mixing. It's something that I am intimidated of! Super cute look! 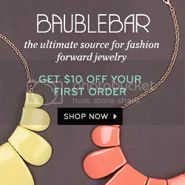 I wish I had that necklace in yellow! I have the blue. 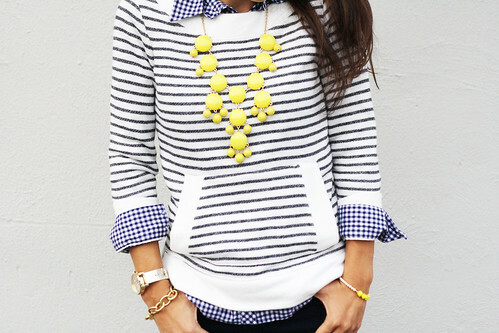 Love the mixing of plaid and stripes with the hint of yellow. You look fabulous and so glad you had a wonderful birthday! You look adorable! Would have never thought to combine the two. Looks amazing!! You look great! & your glasses are stylin'. I wear glasses too except I only wear them at home. I wear contacts most of the time. I'm thinking maybe I should get a new pair so I can wear them more. After all, they are accessories... Happy Monday! Oh yay for your birthday! :) Can't wait to hear more of course. And love that soft yellow that you decided to pair with this outfit. 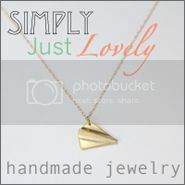 I love your necklace, lovely contrast with your shirt! Lovely as always! Love this look! :) I love both stripes and graham. I need glasses to when I drive especially at night! BUT the have been broken for some time now and I don't wear my contacts like I should.. so night driving has been interesting. I love this mix of patterns and bright color! I hope you had a great birthday! I'm loving the mixture of prints! Perfect pop of yellow, too! love the yellow! so much. you look adorable with glasses on :) loving the stripes and pops of yellow. can't wait to hear about your b-day !! Love the pattern mixing! What's the secret to layering in the heat? You are so beautiful! Can't wait to hear about the birthday deets. 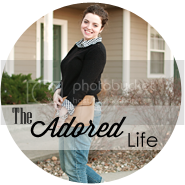 this is seriously such a cute outfit! Girl. You're beautiful. And I love how you mixed patterns! I'm loving the gingham and stripe combo. You look great! and I'm exactly the same way with glasses...but now I wear them all the time because I get headaches from adjusting back and forth! Such a cute look! 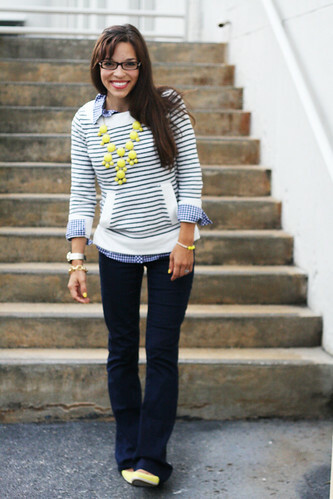 Love the stripes/gingham combo! beautiful! i esp love that necklace! I love this, Anna! So classy and fun. 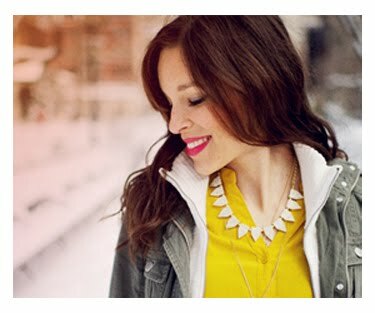 Totally have that necklace. It's bananas. Anna! You are seriously too cute! my gosh, what a beauty you are!